A two-player race? Plenty of other top NHL rookies might have something to say about that. During the 2016-17 NHL season, fans have been treated to one of the most impressive rookie classes ever. Not only are multiple first-year players making an impact on their respective teams, but some, like Auston Matthews and Patrick Laine, are flat-out dominating, producing at absurd rates for freshmen. With so much young talent, the race for the Calder Trophy — awarded to “the most proficient in his first year of competition in the National Hockey League” — features a plethora of candidates. Here are the top 10 players challenging for the trophy. If I had the opportunity to choose one rookie to start a franchise with, I’d pick Matthews. 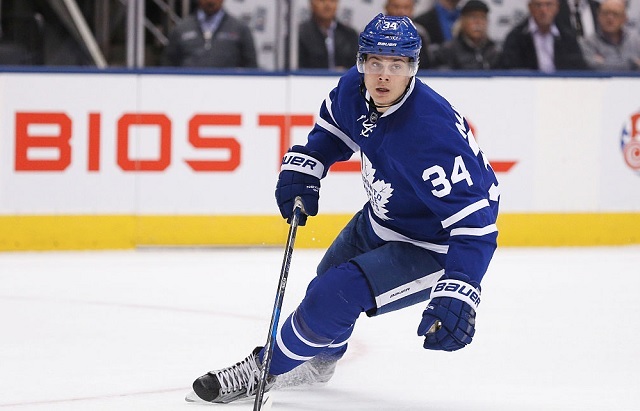 The 19-year-old had lofty expectations placed upon him after getting drafted first overall in the pressure-filled and, at times, overly-hockey nuts Toronto market. Matthews surpassed them quickly, scoring 28 goals and 52 points in 59 games. He leads NHL rookies with 206 shots to boot, peppering goalies like a madman. Matthews doesn’t take shifts off either, as he’s always looking to create scoring opportunities on the ice. Matthews uses his 6-foot-2 frame mixed with incredible footwork and hockey sense to produce some sick highlights. He is a magician with the puck and responsible on both sides of the ice. It’s hard to imagine just how good he’ll be in five seasons. He’s got a legitimate chance to become the 15th rookie ever to score 40 goals. With Matthews, the future is now for the Maple Leafs. He’s helped Toronto close in on a playoff position. He’s the man to beat for the Calder Trophy. In practically any other season, Laine would have the Trophy locked up. But despite Matthews’ edge for the Calder, the 18-year-old Fin has been fabulous for the Winnipeg Jets. Laine leads all rookies with 30 goals and 54 points, scoring three hat-tricks in his young NHL career. He’s got an elite, heavy shot and is incredibly dangerous from the slot in all situations due to his quick release. Laine is undoubtedly an emerging star. However, separating him from Matthews is his deployment and possession numbers. Despite a team-leading 35.9 percent of his starts in the offensive zone, Laine has the ninth-lowest 47.6 Corsi (for shot attempts) on the Jets. He’s also shooting nearly 20 percent (19.9) in all situations and 13.1 percent at even strength. Laine is very good — but he’s also somewhat one-dimensional. He’s got less of a chance to continue his scoring rate than his Maple Leaf counterpart, who also happens to be a much-more complete player. Even with some future regression, Winnipeg’s got themselves one heck of a sniper in Laine. He could lead all rookies in scoring when the season wraps up. Werenski has somewhat quietly put together an incredible season. 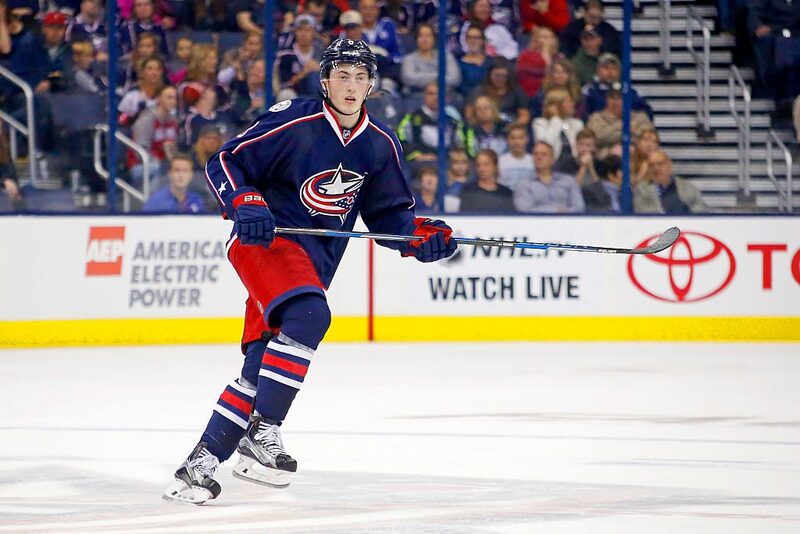 Producing at an above-average rate for his position, Werenski ranks 10th among defenseman in scoring with nine goals, 27 assists and 36 points in 58 games. He’s earned the trust of the notoriously hard-headed John Tortorella, receiving top-pair minutes despite his status. He’s consistently made his teammates better on his way to helping propel the Blue Jackets into the upper echelon of contenders after many expected Columbus to outright stink. Paired with Seth Jones, Werenski is a big part of a young, talented blue line. At 19, his production is extremely encouraging. Werenski might have an outside chance for the Calder, but regardless, he’s put himself on the map as a burgeoning star. Despite playing with Matthews, Marner might be the most fun player to watch on a nightly basis. In the mold of Blackhawks star Patrick Kane, Marner is quick, extremely creative and sees the game with top-flight vision. He’s got the rare ability to do so much with so little room to operate. Marner’s fit in quite well on a line with veterans James Van Riemsdyk and Tyler Bozak — and basically, anywhere the Leafs have slotted him. In 56 games, Marner has 15 goals, 33 assists, and 48 points. Once considered too diminutive, at 5-foot-11 and 175 pounds soaking wet, Marner’s skill has erased any concern on how his stature would play in the pros. With Matthews, Marner and William Nylander (mentioned later), Toronto’s future forward nucleus is filled with unfair potential. A recent injury and sharing the Calder spotlight with two teammates might sink his chances of being nominated, however. It’s kind of weird Murray’s on this list, as the 22-year-old appeared in 12 regular season games and 21 playoff games for the Penguins in 2015-16, winning the Stanley Cup. However, Murray’s still technically a rookie, so it would be unfair to not include him. Murray, when healthy, has put up quality numbers in Pittsburgh. In 33 games, he’s sporting a 22-7-3 record with a 2.27 goals against average and a .926 save percentage — a number that rises to .936 even at even strength. Murray’s consistent effort has cemented his status as both the starting goaltender in Pittsburgh and as one of the league’s best netminders. He’s got an real chance to win two Stanley Cups as a qualified rookie. That’s hella impressive. Son of longtime NHLer Keith Tkachuk, Matthew has quickly established himself a hard-working rookie who’s earned the trust of his coaching staff. He’s fifth on the Flames, starting 39.7 percent of his starts in the defensive zone. Despite dispropriate offensive/defensive starts, Tkachuk’s offensive game is real. Tkachuk leads all Flames by a wide margin with 2.26 points/60 minutes. He’s scored 39 points 56 games while only getting 14:20 minutes of ice time per game. Paired with shot-generators like Mikael Backland and Michael Frolik, Tkachuk has shined. With more opportunity, he’d be higher on this list. There’s a lot to like about his well-rounded game. Personally, it feels like a travesty to include a player as talented as Nylander this low, but that’s how good the rookie class has been in 2016-17. Nylander’s scored 17 goals and 42 points in 58 games, generating a stellar 19 points with the man advantage. He’s lightning quick, creative and has a great release (notice a trend among Leafs prospects?). However, what’s preventing him from being higher on this list is his tendency to disappear for stretches and his defensive game needing work — simple issues that eventually will be corrected with more experience. Nylander is another rookie sensation in Toronto. Leafs fans are blessed. Skjei has turned into a quality top-four defenseman as a rookie on a mediocre Rangers defense. After stints with the U.S. National Development Team, the University of Minnesota and the Hartford Wolf Pack, the 22-year-old has thrived in his first full NHL season. He’s quietly put up 28 points while playing a responsible two-way game. Skjei is a future top-pair guy, who should be getting more minutes, than the 16:47 he’s earning now. I’d be lying if I admitted to knowing who Aho was before the season began. Drafted 35th overall in 2015, the talented Fin has come out of nowhere, ranking second on the Hurricanes with 32 points in 56 games. Aho’s a good passer and responsible on both sides of the ice. At 19, he’s a nice piece for a young team going forward. Mantha’s time in Detroit has been filled with ups and downs. He’s gone from elite prospect to trade bait to AHL banishment with little opportunity before this season. Well, Mantha finally has gotten his chance on a terrible Red Wings team and produced. In 45 games, the 22-year-old has 13 goals, 18 assists, and 31 points. Mantha’s one of the few pieces in Detroit the team can rebuild around.